While I was working on a new laptop this afternoon, I noticed that the Profiles icon was missing from System Preferences. This system was managed by our Casper server and we’re using both certificate-based communication and an APN certificate, so it should have been there. Moreover, when I ran profiles -P, I saw that no profiles were installed. Running jamf mdm -verbose fixed the issue by installing the MDM certificate, but I wanted to ensure that any other machines with the same issue were found and then automatically fixed by Casper. After a little research, I have a process that does this. See below the jump for details. The latter advisory is especially noteworthy to Mac admins, as that means that Apple’s XProtect was updated to block older versions of Java. That said, XProtect was not updated after the latest round of updates in June 2013, so those versions were not previously set in /System/Library/CoreServices/CoreTypes.bundle/Contents/Resources/XProtect.meta.plist as the minimum allowed versions. See below the jump for more details. I’ll be speaking about FileVault 2 at MacSysAdmin 2013, which is being held from September 17 – 20th, 2013 in Göteborg, Sweden. For those interested, my talk will be on Wednesday, September 18th. For a description of what I’ll be talking about, please see the Wednesday program page. As part of building a custom OS X installer ISO for my ESXi server, I wanted the ability to include Server.app as part of my installation process. One problem with that is that Server.app is only available via the Mac App Store and doesn’t have a separate installer available for download. However, if you have already purchased Server.app, it is possible to get a copy of the Server.app installer from the Mac App Store. See below the jump for details. 1. Make sure that your document is saved in Word’s .docx format, as the equation editor will only be available to documents in that file format. If you have a .doc document open in Word and need to work with the equation editor, please save your document in .docx format. 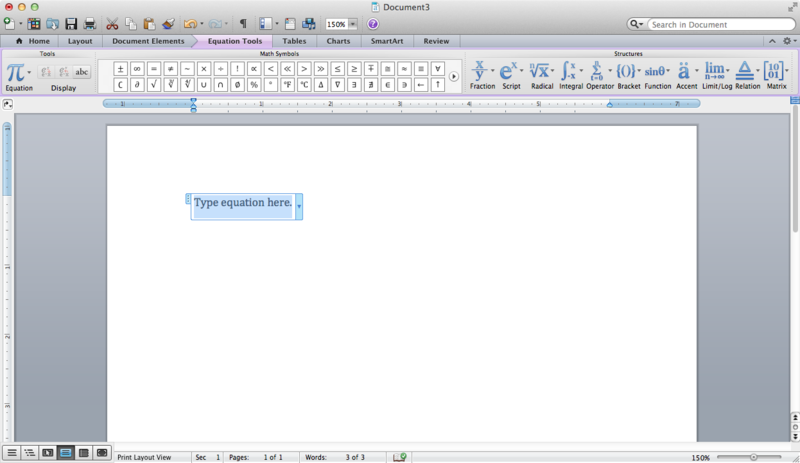 Once saved in .docx format, the equation editor will become available. 2. Select the place in your Word document where you want a new equation to be inserted. 3. Under the Insert menu, select Equation. 3. The Equation Tools will open in the toolbar and you’ll be prompted in the document to type the equation. 1. Make sure that your document is saved in Word’s .docx format. 2. Click on the Document Elements tab in the toolbar. 3. In the Document Elements tab, click on the pi symbol (π) to access the Equation Tools. 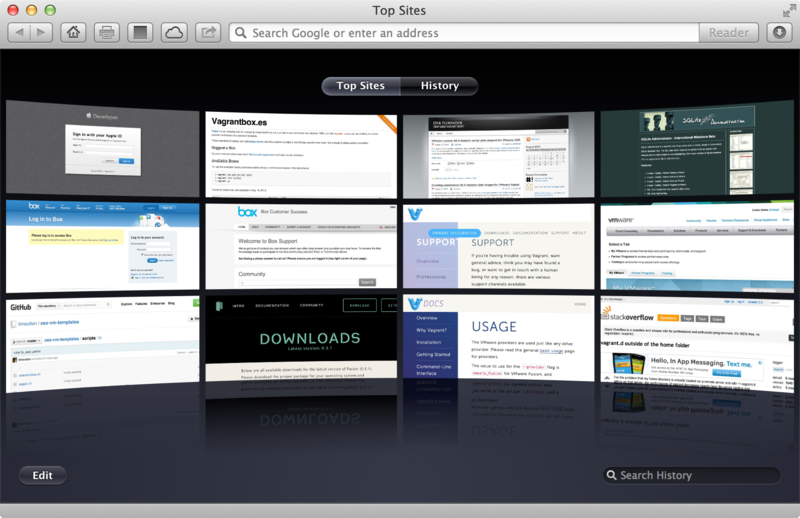 While testing a new machine setup today, I noticed that Safari wasn’t opening to the default homepage like it should. Instead, it was opening Safari’s Top Sites. There wasn’t an obvious way to set the Safari new window setting from the command line, but with the assistance of Greg Neagle, I’ve mapped out the applicable keys and their settings. See below the jump for the details. I’ve updated the create_vmware_osx_install_dmg.sh script that I had previously posted about here. It now includes the ability to create an .iso file, which can be used with VMware ESXi servers running on Apple hardware. See below the jump for the details.